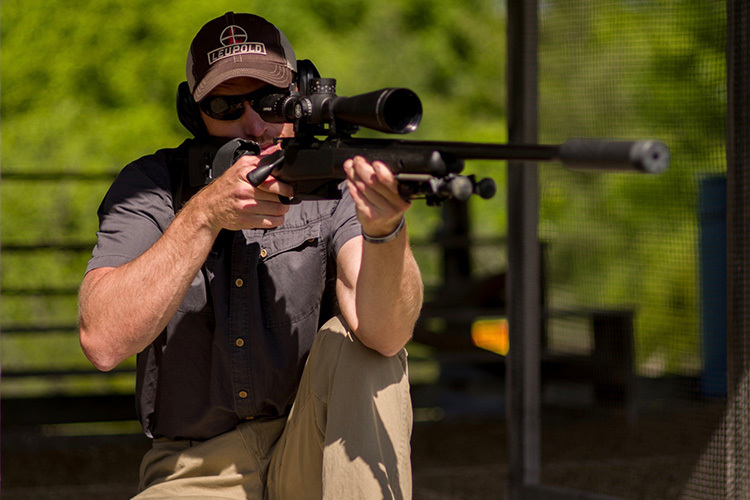 Our shooting expert shares his secrets to building your rifle-shooting skills the easy way with these simple, dry-firing exercises. 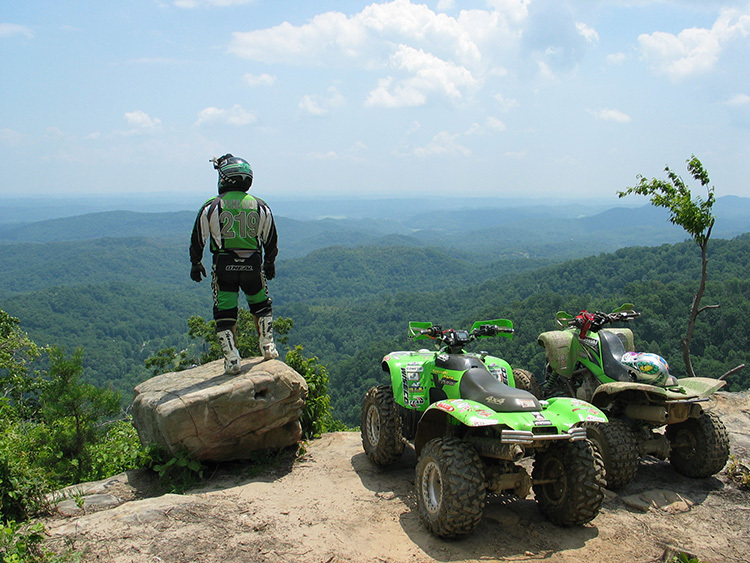 Photograph Courtesy Howard Communications, Inc. The key to becoming a good shooter is that you and your rifle must work in unison. 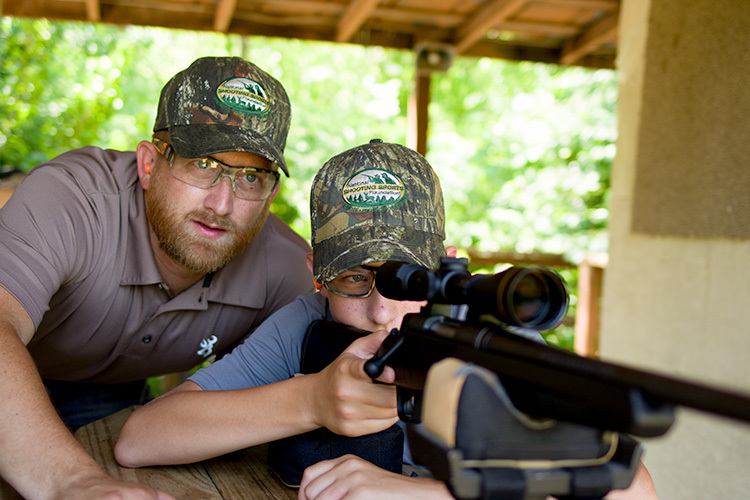 Good shooting starts by learning to control your breathing and trigger finger as well as the rifle to keep the sights on the target. 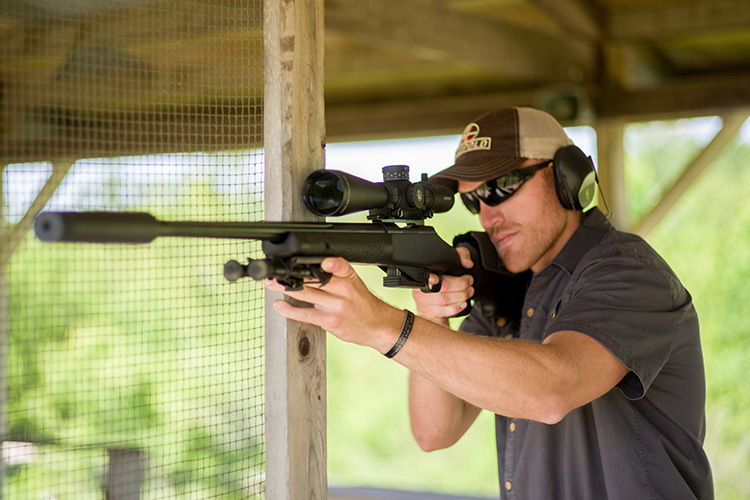 Here are some simple things you can do that will build your shooting skills in no time. 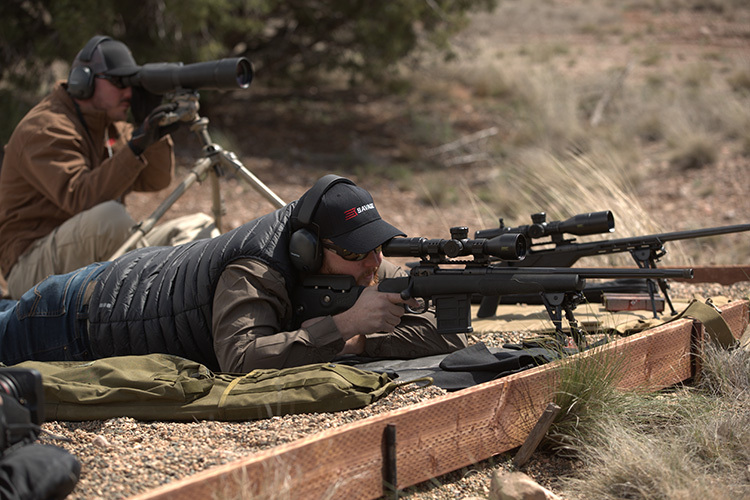 Learning the basics of breathing and trigger control is best done at the bench, where the rifle can be supported by sandbags under both the buttstock and forend to reduce reticle movement on the target. The fundamentals are very important. That is, to hold the reticle (your aiming point in a scope), on the target until the trigger breaks the shot smoothly. Sounds simple enough, right? So does making a hole in one in golf. However, it’s not as hard as it looks if you follow this simple strategy. 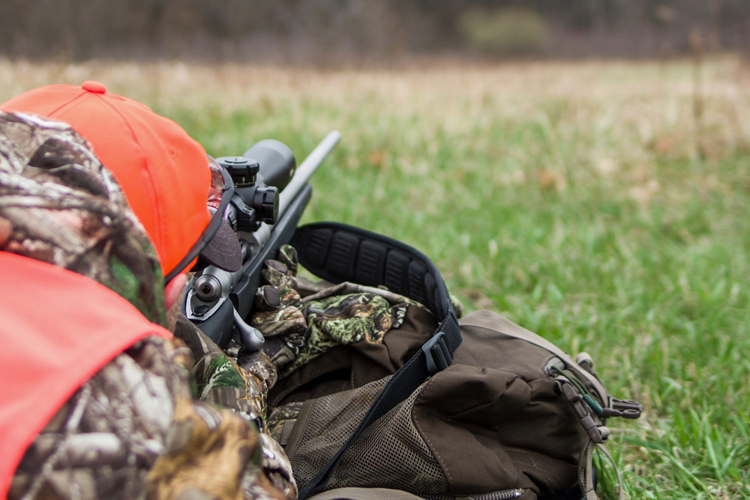 Unless you are shooting from a solid bench rest, it is impossible to hold the reticle perfectly still on the target. When muscles are supporting the rifle, there is going to be some wobble. The key to shooting accurately is to control the wobble within a circle that stays on the target. If you have a two-inch bullseye and the wobble stays within that two inches, you should, in theory, hit the bullseye every time. The trouble is that most people see the reticle heading to where they want to hit, and they jerk the trigger thinking they will shoot as the reticle crosses the center of the target. That all but guarantees a miss. The correct approach is to focus on the cone of wobble and keep it as small as possible while you execute a smooth trigger pull that does not influence the rifle other than to make it fire. If you jerk the trigger or flinch in anticipation of the shot, you will miss. To master trigger pull, start by "dry firing" on the bench with an empty gun. With the gun in the proper rest and on target, practice slowly pulling the trigger until it breaks. Done properly, there should be no wobble on the target. The path to executing a smooth trigger pull is to increase pressure on the trigger gradually and smoothly until the gun fires. 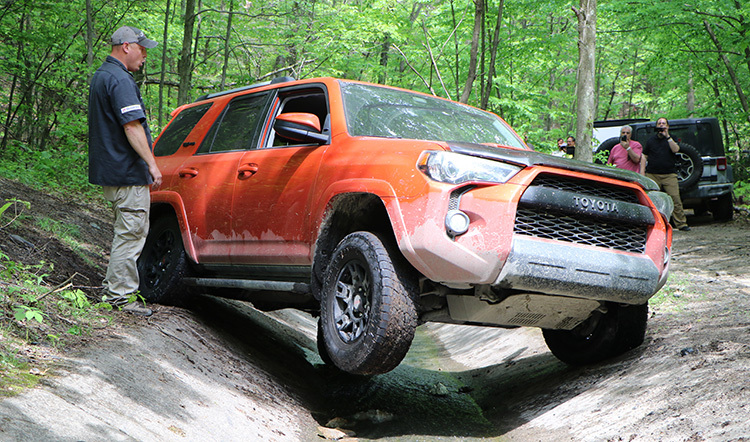 Some instructors say the shot should surprise you. That is true initially and is a good teaching concept to use for learning the basics. However, as your shooting skills build you will reach a level where the shot should never surprise you. Train with your rifle and the trigger until you know precisely when it will break and fire the gun. I worked in the shooting venue at the 1996 Olympics and one of the top rifle shooters in the world was struggling with his new rifle because the barrel was two inches longer than the barrel on his old rifle. He was so tuned into breaking the trigger at exactly the right time in the cone of wobble that the extra time the bullet was spending in the longer barrel was causing his bullet to strike past his intended point of impact. That level of awareness with your trigger break may be unattainable for those of us with less than Olympic levels of skill, but it’s always best to keep high goals. Once you've mastered shooting from the bench, you're ready to begin practicing field positions. Shooting prone is the steadiest position as you can support the rifle both fore and aft to minimize movement on the target. Your body is a dynamic machine and is always in motion; breathing and even your heartbeat can influence the rifle and cause the shot to miss. The conventional breathing method taught to shooters is to take a deep breath, let it half out and hold until the shot breaks. This is an excellent approach to learning shooting skills. Later on, you may modify your breathing technique to fit your personal style and to adapt to the situation. For example, this breathing method is fine for shooting slow fire, but three-gun competitors may have to run some distance and then engage multiple targets very quickly. In this scenario they may be breathing hard, so those shooters develop a much different breath control protocol. Heartbeat? Well that’s something you have very little control over. It helps to be in shape, so your resting heartbeat is relatively slow. When practicing you will do little that will raise your heart rate. So, for now, say calm and ignore your beating heart. As your skill level rises you may re-address this issue. The top long-range shooters have learned to shoot between heartbeats. That’s where that precise level of trigger control comes into play. For now, just be glad your heart’s still beating and try to ignore it while you practice. The sitting position is more difficult than shooting prone. 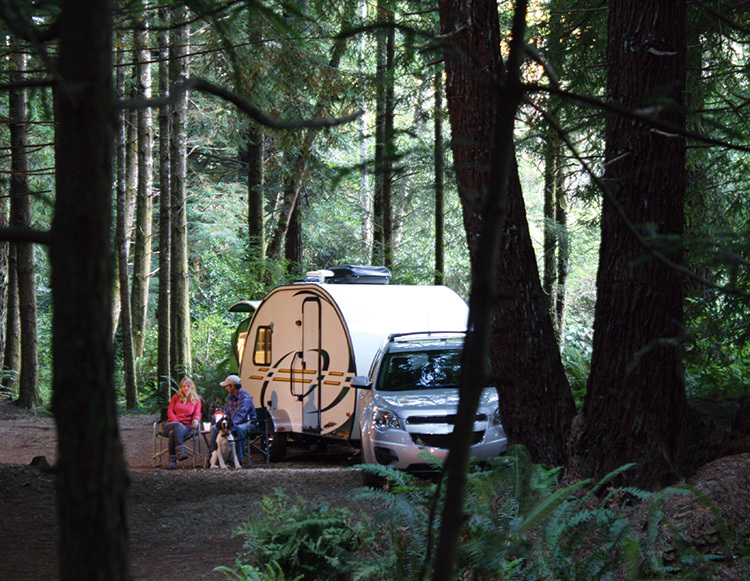 You can minimize wobble by leaning back against something, like a tree or post, and locking your elbows into your knees. Dry-fire is the practice of “shooting” with an unloaded rifle, so the firing pin falls, but there is no cartridge to fire. This is the best way to learn these fundamentals as using ammo masks the problems when the gun recoils. It is fine to dry-fire a modern centerfire rifle and most rimfire rifles. However, the safest approach is to use a snap cap. A snap cap is an inert cartridge that will cushion the firing pin and absorb the energy. This helps prevent firing pin breakage while dry firing. In a rimfire it’s possible for the firing pin to strike the edge of the chamber and peen it, making the gun useless until it’s fixed by a gunsmith. Both situations are rare in a modern firearm, but just to be safe use a snap cap. Quick tip: No rifle can ever perform to its potential unless it has a good trigger. Consider taking your rifle to a gunsmith to smooth up the trigger pull. Better yet, have them install a replacement trigger, like a Timney. It is the single best improvement you can make on most rifles to improve accuracy. Kneeling to shoot is more difficult than sitting. Practice this position by dry firing to get a feel for minimizing reticle movement on the target. 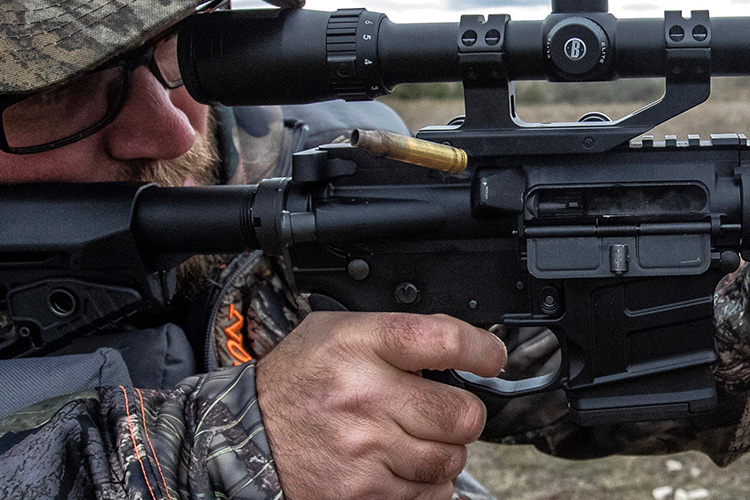 Locking an elbow into a knee will help steady your rifle. The best way to perfect your shooting skills is to start off on a shooting bench. Rest your rifle in sandbags, both under the forearm and under the toe of the stock in the back. Never rest the barrel. Your “weak” hand should be under the back of the stock, not up front as it would be in other positions. Use that hand to manipulate the back sandbag to help aim the rifle. With the gun unloaded, aim at the target. With this rest you should be able to keep the reticle on the target with little or no wobble. If you are not steady, adjust the sandbags until you are. Keeping the reticle on the target, slowly pull the trigger until the firing pin drops on the snap cap. The reticle should remain on the center of the target as the trigger breaks, the firing pin falls and for the follow-through. Standing is the most difficult shooting position to master because there is so little to support the rifle. 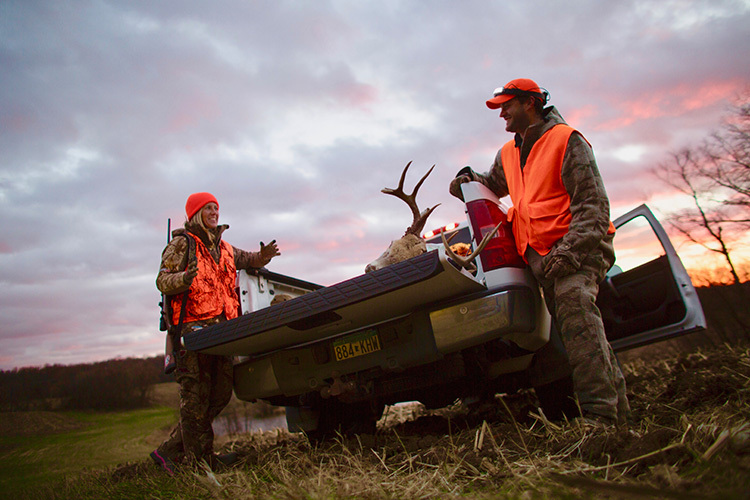 Using a pole or tree as a rest will help you control reticle movement on the target. Just like tennis or golf, follow-through is important to shooting accurately. Try to keep your eye on the target for a few seconds after the trigger releases. This is your follow-through. Of course, this will be difficult with live ammo and the recoil shooting generates, but the key is to stay in position on the gun and not move or look up and "peek" at your shot. Stay in form for the follow-through. It's only a second or two, but it’s very important. Here’s why: It takes time for the bullet to exit the bore after the shot is fired. If you move the rifle during that millisecond, you will miss. Follow-through prevents that. 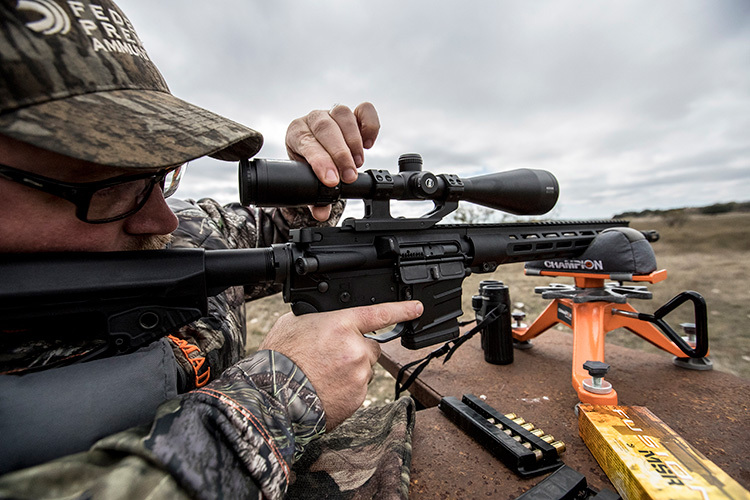 Once you are able to break the trigger, stay on the gun for the follow-through and not move the reticle off the target, you are ready to try some field positions. 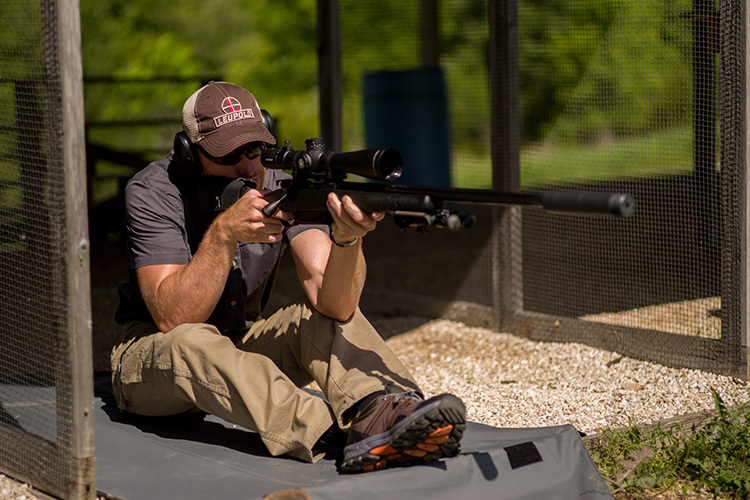 Start by practicing from the prone position, using a support both on the front of the rifle’s stock and at the rear, just as you did on the bench. Practice there until you have mastered keeping the reticle on the target through the dry-fire shot. Then you can move to sitting, kneeling and the most difficult of all shooting positions, standing. With these positions, you will quickly see my point about keeping the wobble to a circle and trying to keep that circle on the center of the target. The smaller the circle, the smaller your groups will be, but it takes practice. It also takes mental discipline to execute a smooth, steadily increasing trigger pull while you maintain that cone of wobble. By dry-firing you will see your mistakes through the scope. Once you have mastered all this by dry-firing, do it all again with live ammo. It helps to have a friend spot your hits on the target with a spotting scope. That way he or she can identify any problems that develop. If you start to encounter problems, like target panic where you jerk the trigger, or flinching in anticipation of the recoil, stop. Unload your gun and go back to dry firing until you have it under control. Who knows, maybe you will be on the Olympic team in 2020. About The Author: Bryce M. Towsley has been writing about guns for 36 years and has published thousands of articles in most of the major firearms magazines. He has hunted all over the world and is a competition shooter in several disciplines. Towsley has several books available on guns, shooting and hunting as well as an adventure novel, The 14th Reinstated. Signed books are available on his website.